News from the front desk Issue 430: If it weren’t for dreamers and pioneers of life we wouldn’t get very far. So the whole prefab and lightweight construction industry needs to thank Strongbuild for its spirit to strike into new fields. There’s an old saying in property that when it comes to big hotels, resorts or other giant endeavours it’s never the developer and originator that benefits; typically they go broke and it’s the second or sometimes the third owner that reaps the rewards. Generally it’s because the newcomer taps into the cycle and picks up a bargain, then all they have to do is wait for the market to do all the heavy lifting. Sadly when it came to Adam Strong and his brothers who started Strongbuild, their brave prefab lightweight manufacturing endeavour at Bella Vista in north west Sydney didn’t even find a buyer at a bargain basement discount. After a massive 70 or so parties showed interest, there was no one who came to the party with an open chequebook. Even a particular intending buyer who signalled they were prepared to pay a “substantial” price for the business as a going concern, pulled out. The worst possible scenario, according to voluntary administrator Brian Silvia of BRI Ferrier, came to pass. The premises needed to be vacated (a big sticking price was the high rent; owner Mulpha said it was too cheap) and the expensive Hundegger equipment that then needed to be disassembled and sold bit by bit. That’s apparently a dangerous thing because to recreate the manufacturing plant you need all of multiple parts and there is no guarantee you can secure each and every one in an auction environment. End of story. The prices achieved we hear were very low. It’s hard to imagine what the well-liked Strong family is going through right now. A big consolation must be that their business on the South Coast of NSW at Berry will complete its order book and may even have a “life after death”. Staff may be paid, though nothing is certain, as Silvia points out. But though it’s cold comfort the Strongs should also be happy they have carved a new path for an industry that promises so much greater sustainability than in the past. Waste on typical building sites gets up to around 30 per cent. Think about that in a world where resources are shrinking fast, where we’re running out of sand and other natural materials to meet massive construction needs and where people are starting to wonder when the “Buy Nothing New” campaign starts to become “Build Nothing New”. If we want our quality of life to continue we may need to budget. Carefully. And be more creative. That’s where the Strongs and this fresh young industry comes in. It offers not so much cheaper construction but a more regulated and quality controlled product, using fewer materials and the ability to repurpose scrappy timber products in a way that gives them great strength, and at the same time stores carbon. According to industry sources there is no doubt that the industry will continue to flourish. And what happened to Strongbuild does not look to be reflective of the strength of the sector. More a case of the market downturn than anything else. There is more innovation in the wings. More flexibility with design, for instance, that will expand on Australia’s current constraints that tend to produce boxy, low ceilinged modules, to more flexible and creative European style solutions. Price is still not the advantage, but the bonus of greater site safety, trades co-ordination and the practical elimination of weather impediments, are advantages enough. Financing is another impediment that might change. Traditional financial models find it hard to deal with pre-fab housing because there is not actually a saleable product until the finished house is on site. In regular building, progress payments protect the interests of the financier so that if the project fails there is at least a part completed house that can be sold. 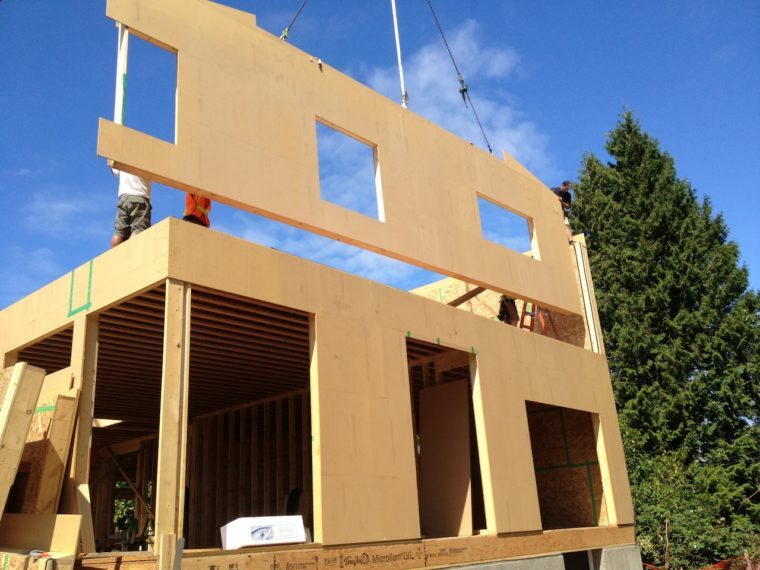 With prefab there is only land value and the finished product, nothing in between. But news out of New Zealand has pointed to a funding model by Westpac that offers construction loans to pre-fab home-buyers. “Mark Dunmore, head of home ownership at Westpac, said pre-fabricated houses could shave 60 per cent off the build time cutting it down from around 22 weeks to seven or eight weeks,” a New Zealand Herald report said. But despite the advantages of stand-alone or volume housing opportunities it’s the multi-residential options that the industry is finding most attractive because of the advantages that prefab offers in dealing with often difficult inner city sites typically favoured for apartments. Supply of timber is another issue. Softwoods take long enough to mature, about 15 years and hardwoods more than twice that time. But coming onto the market now are new products and ways to better use previously considered secondary products. Joining CLT and Glulam potentially is a new product under consideration in Tasmania called Eucalyptus nitens or shining gum, a typically low grade “scrappy” wood chip. A slight dampener on this otherwise positive outlook though is the potential closure of the XLam factory in Nelson on New Zealand’s South Island. A spokeswoman from Hyne Timber which bought XLam four years ago said the plant was under review with a decision to be made by the end of April. Early in March, XLam New Zealand commenced a business review and consultation with employees and key stakeholders at its manufacturing plant in Nelson. The company is committed to the New Zealand market and wants to ensure continuity of supply of Cross Laminated Timber in the most efficient and commercially sustainable way. There is strong and growing demand for CLT in New Zealand and XLam is committed to ensuring the company is positioned to meet that growth in the most cost efficient and competitive way into the future. This includes consideration of supply from XLam’s new, state-of-the-art plant in Australia which continues to scale up. The plant has 37 staff and had been an active recruiter of refugees in the area. Meanwhile chief executive Gary Caufield has been replaced by long term Hyne Timber staffer Shane Robertson, Maryborough in Queensland at Hyne Timber’s headquarters. By contrast the plant in Australia at Wodonga was “state of the art and highly automated” and would continue to scale up.